Aldactone, a water pill, is used to treat high blood pressure and fluid retention caused by various conditions, including heart disease. Spironolactone causes the kidneys to eliminate unneeded water and salt from the body into the urine. Spironolactone is also used to treat certain patients with hyperaldosteronism and in certain patients with low potassium levels. Spironolactone medicine is sometimes prescribed for other uses; ask your doctor or pharmacist for more information. Aldactone is a diuretic and is used as an antiandrogen. Aldactone is a synthetic drug. Aldactone belongs in a class of pharmaceuticals called potassium – sparing diuretics. Aldactone comes as a tablet to take by mouth. It usually is taken once a day in the morning with breakfast or twice a day with breakfast and lunch. Follow the directions on your prescription label carefully, and ask your doctor or pharmacist to explain any part you do not understand. Take spironolactone exactly as directed. Do not take more or less of it or take it more often than prescribed by your doctor. Spironolactone controls high blood pressure but does not cure it. Continue to take spironolactone even if you feel well. 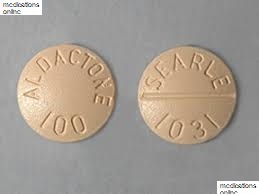 Do not stop taking spironolactone without talking to your doctor. DO NOT DRIVE, OPERATE MACHINERY, OR DO ANYTHING ELSE THAT COULD BE DANGEROUS until you know how you react to this medicine. Using this medicine alone, with other medicines, or with alcohol may lessen your ability to drive or to perform other potentially dangerous tasks. DO NOT USE A SALT SUBSTITUTE or potassium supplement without checking with your doctor. BEFORE YOU BEGIN TAKING ANY NEW MEDICINE, either prescription or over-the-counter, check with your doctor or pharmacist. FOR WOMEN: THIS MEDICINE IS EXCRETED IN BREAST MILK. DO NOT BREAST-FEED while taking this medicine. If overdose is suspected, contact your local poison control center or emergency room immediately. Symptoms of overdose may include nausea, vomiting, weakness, and lightheadedness. Renal dysfunction (including renal failure) If you notice any severe/persistent symptoms inform your health care professional.